Take an interactive 3D walkthrough – at the click of a button! RoomSketcher Live 3D Floor Plans are a fun and interactive way to view your project. 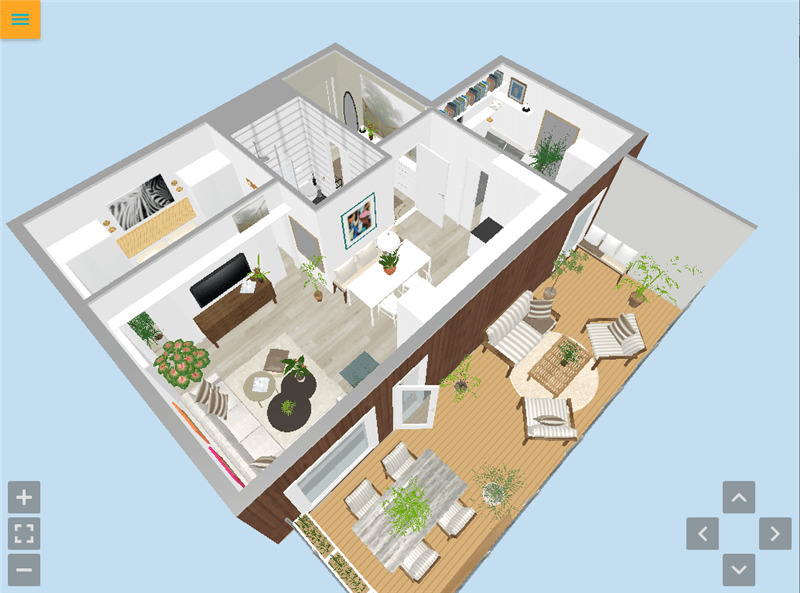 Take a virtual walkthrough of your home design or real estate project in interactive Live 3D! Our powerful 3D rendering and visualization technology makes it easy. Simply click to view your floor plan in Live 3D and explore it in three exciting interactive ways – Fly over the floor plan to get a clear view of the layout from every angle, navigate through the space with an avatar, or walk around and view rooms as if you are actually there! RoomSketcher Live 3D Floor Plans make virtual walkthroughs fun, easy, and engaging. They are the perfect way to view a project or property. If you are working on a home design and renovation project, the quick rendering time makes it easy to view changes instantly. If you are marketing real estate properties or home development projects, Live 3D Floor Plans are an easy, affordable and convenient way to enable potential home buyers to take a virtual walkthrough of your properties online. Great 3D Visualization – Our state-of the art 3D visualization gives a “true” feel for of what the space looks like. Interactive – a dynamic, user-controlled experience with multiple ways to view and walkthrough your project in 3D. Instant – Make a change to your floor plan and view the changes instantly, no turnaround time needed. Affordable – Easy and affordable alternative to expensive virtual tours that need to be created onsite with 3D cameras or video. Online – Access your Live 3D interactive walkthrough anytime online – right from your computer or mobile device. Share your Live 3D Floor Plans with friends, family and clients. This is a fantastic way to show your home design project or an available real estate property – in Live 3D! Add your Live 3D links to an email or embed them on your website. Your viewers simply click on the link to open – it couldn’t be easier. There’s no better, easier or cooler way to see a home design or property!